Lately I’ve spoken to several friends in the New England area and have been reminded of one of the many reasons we decided to move to West Virginia, those warm early springs. So while there’s still snow at our old home in New Hampshire springtime foraging is really in full swing here. There’s ramps, may apples, dandelions, creasy greens, and loads of other wild edibles coming up in the woods and fields right now. 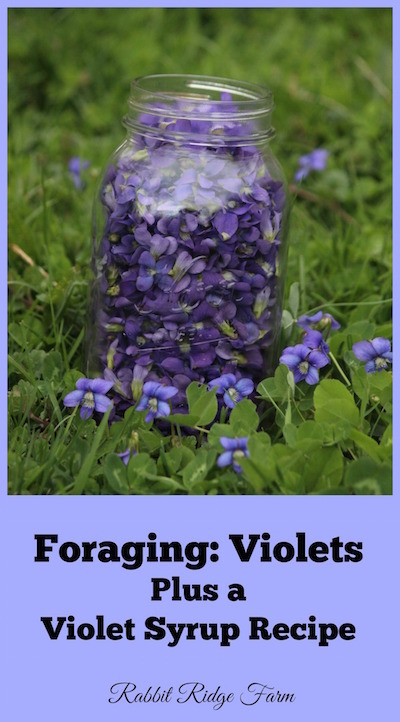 While I love foraging, violets are something that I’ve actually never tried. Here at the new place our yard is carpeted with them so I decided to give it a go. 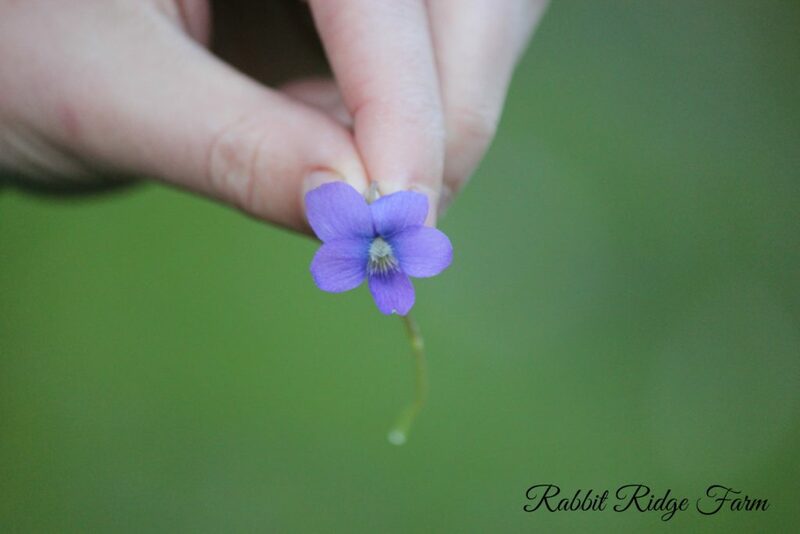 The Common Blue Violet (Viola sororia) is what I foraged to be exact. Both the leaves and flowers are edible and high in vitamins A and C. They are found in the woods, meadows, and even lawns but they prefer somewhat moist areas (I have seen a few in pretty dry spots though). These violets are easy to identify. They grow low to the ground and their flowers range from white to purple with five petals. Their leaves are also easily recognized with a distinct heart shape and scalloped edges. You’ll find them flowering from March-July depending on where you live. The Common Blue Violet’s range includes most of eastern North America as far west as Wisconsin. Both the leaves and flowers have a mild taste that’s a perfect addition to salads. Plus you want the prettiest salad around? Violet flowers will get you there. When I wanted to use some of our violets I wanted something a little more non-traditional though. I mean salads are great but greens make up a lot of the spring harvest so I searched for other violet ideas. I stumbled across two ideas. First violet flowers can be candied. We didn’t try this as I’m just not a big candy eater, unless it’s chocolate of course. Then I found out you can make violet syrup! It’s too gorgeous not to want to make. It does take a lot of flowers though. You’ll need to fill the same size jar that you wish to be eventually filled with the syrup. I chose to use a quart or about 3 cups. After you’ve spent time picking all those beautiful little flowers (it’s really meditative isn’t it?) you’ll need to boil your water. If you haven’t already place your flowers in a glass jar. Then pour the boiling water over the flowers. At this point your violets will need to steep for 24 hours. This is where a mason jar comes in handy. I just put the lid on and left it on the counter until I was ready to come back to it. After 24 hours your water should look blue/purple and it’s time to finish your syrup. First strain out your flowers. I used a fine wire mesh strainer. Be sure to press all the liquid possible out of your flowers! Then begin heating your liquid and add the sugar, stirring it frequently as it comes to a boil. Boil it for a few minutes and then turn off the heat. You may notice that your syrup’s color isn’t as bright as you’d like but just wait! Slowly add lemon juice a drop at a time and watch the color change. You can keep adding until you’ve reached a dark purple if you’re so inclined. Then it’s ready for use or to be bottled back up and stored. With all that sugar it won’t go bad much like maple syrup. Now I’m sure you’re wondering what do I do with this beautiful stuff? I’ve tried it two ways thus far, in tea and in seltzer water like a pretty purple and flowery soda. I’m also thinking it’s gunna make for some amazing cocktails this summer! Or purple pancakes? Imagine the possibilities. If you’re looking for a wildflower field guide my favorite and the one I use here in West Virginia is the National Audubon Society’s Field Guide to Wildflowers: Eastern Region. It has awesome glossy photos. Also if you don’t want to pick all those flowers or can’t find any in your area, no worries, we’ll have some bottles of our syrup up on our Etsy shop soon. This post contains affiliate links. Should you choose to purchase something we receive a tiny percent at no extra cost to you. 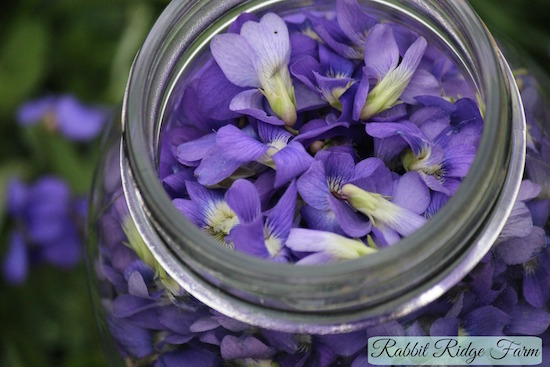 4 Responses to "Foraging: Violets Plus a Violet Syrup Recipe"
violets have been used by country herbalist to take down internal swellings and swellings due to infections… Helps with toothaches also. Candying/sugar violets are not used so much for candy per say..but rather they are stunning decorations for cakes and cookies etc…. This post http://www.theyrenotourgoats.com/in-the-kitchen/violet-jam-a-recipe-round-up/ is a violet round up and has some links to some great articles. Not sure about books, sorry. Best of luck! « Foraging: Bring Back Ramps!